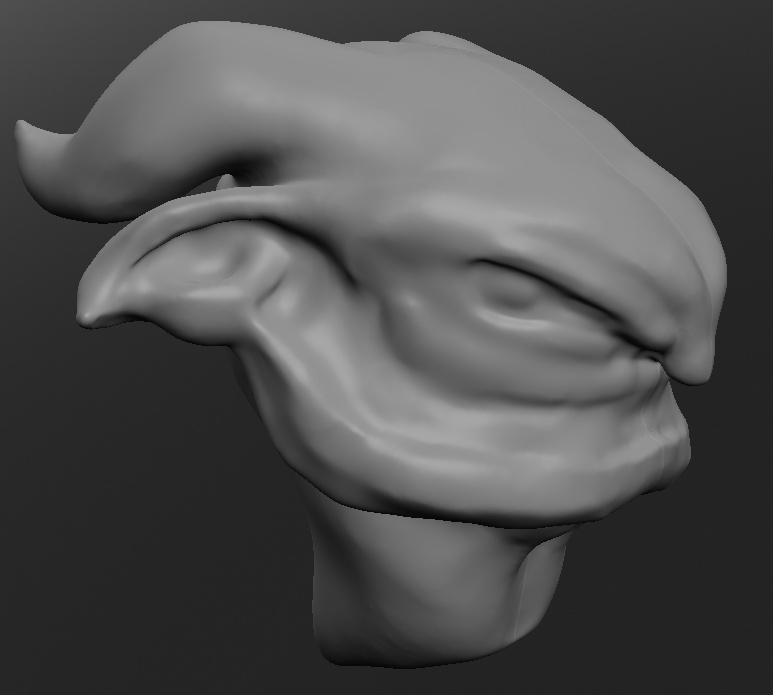 3mpty: Sculptris is a virtual sculpting program. It's pretty neat. Try it out, it's free to download. I just use a more advanced version of Paint. And no, I use the mouse. My graphics tablet isn't compatible with multiple monitors, so it pissed me off and I never really got the hang of it/ever used it. Wow... just watching their demo video, it doesn't look ridiculously hard. OMFG! I love this program! Within 5 minutes (and that includes download, extraction and open time) I've got a ball with a nose, eyes, jawline and brow. This program is awesome! I've got a Graphics Tablet arriving in a few days. 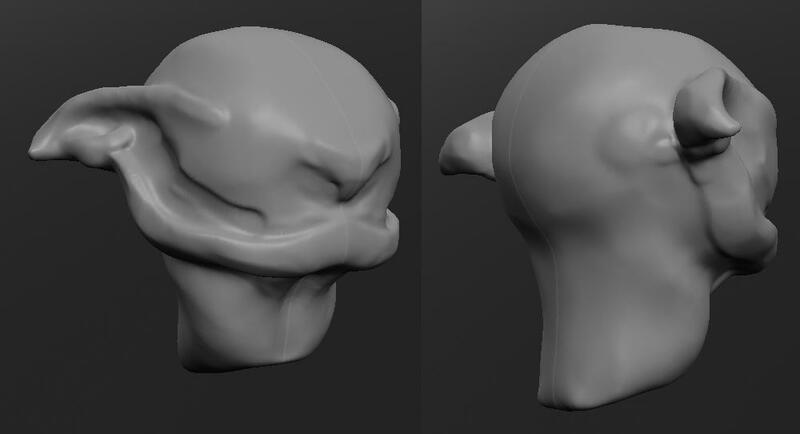 Sod it, I'm going on Sculptris again. And I've made the whole head too wide, but you can't tell from this angle. I'm going to redo it when I get back to uni, make it less squat and try to make the exposed cheek region look less like a giant grin. How does that program work? I'd like to sculpt a few things myself. You get given a sphere and you sculpt it. It's just a case of adding and subtracting virtual claw. Left mouse adds, right mouse subtracts; press X to invert these. There's a few other tools but I have yet to use them... and it'll probably turn out they're incredibly useful. I've used the smooth tool, which is much stronger than just holding shift (see below); and, of course, I've played with all the tools but the draw tool seems to work fine. Holding shift whilst clicking either button will smooth, and holding space will bring up a little interface with brush size/strength. Alt+Left Mouse rotates the camera, Alt+Right Mouse moves the camera, Scroll wheel zooms. um...........? okay? Everyone has a part in the content design for Pallis...? 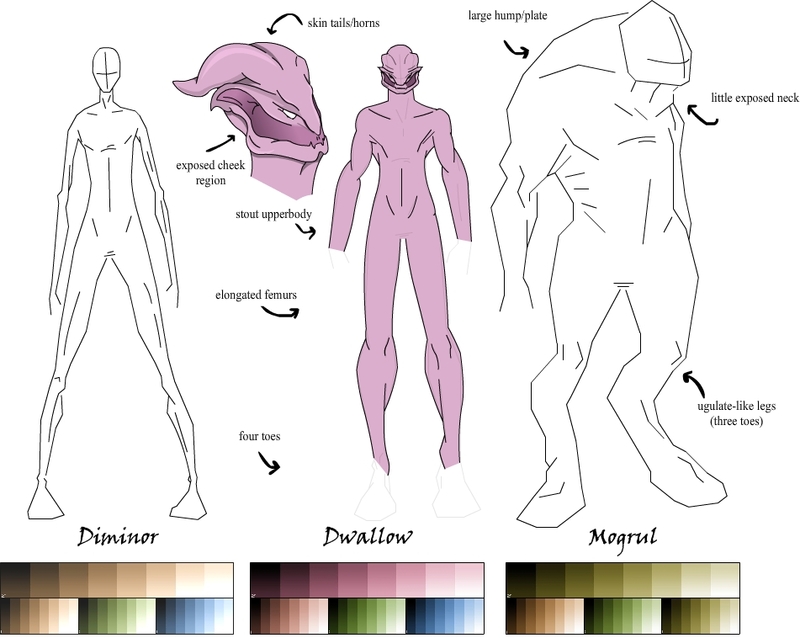 well Google "sculptris" or go here: http://www.zbrushcentral.com/showthread.php?t=090617 its free and awesome! My computer at home runs it fine and it's old. In the trailer when he was drawing a fish, he managed to make a really long dorsal fin really quickly. I haven't figured out how to do that yet. Whenever I want a long extrusion I have to mash the mouse button so I'm drawing a blob on a blob repeatedly. That's how I did the ears and skintails, but it takes ages compared to in the video where he seemed to just click and drag and it drew a line. lol of course it takes longer than the video portrays! Obviously, but they create long extrusions seamlessly... even if they've sped it up, I still seem to be doing something wrong. Using the inflate tool works a lot quicker, so I think that's what they must've used.